Low friction and wear resistance are two fundamental benefits brought by tool coatings. Coatings also prevent similar materials in the tool substrate and part material from interacting to cause tool and part damage. Robust, long-life coated tooling, in combination with the right lubricant in the right amount, can yield top-quality parts hit after hit. Photo courtesy Phygen Coatings. The use of coatings for metal-stamping tools originally arose from the need to form stainless-steel exhaust components in automobile applications. Why? When attempting to form stainless steel, chrome in the tool-steel substrate would weld to the chrome in the stainless steel, with galling occurring almost immediately. Coatings form a barrier to prevent this chrome-to-chrome contact. Today, coatings can bring all manner of advantages in specific metal-stamping applications, with a number of coating options available comprising various adhesion processes and temperatures. That said, even the best coating cannot make up for inadequate substrate. Base tool material must be matched to its intended use, with the properties and characteristics selected to produce quality parts time after time. In addition, the introduction of new part materials demands improved coating solutions, which process experts have delivered. With exotic tool materials subject to scarcity, protective tool coatings become even more critical. We explore all of these issues with leading coating-solutions providers. For its part, tool-coating company Phygen Coatings Inc., Minneapolis, MN, applies its patented FortiPhy physical vapor deposition (PVD) technology to create a thin and dense nanocrystalline coating structure onto any tool-steel substrate. Described by president Dave Bell, the process creates a higher level of adhesion than is possible with conventional coating processes. And, other processes may use a method of adhesion that, unlike Phygen’s, pulls carbon from the tools to help the coating stick. Doing so depletes the tools’ carbon grains, hampering tool life, Bell says. Carbides can play havoc, resulting in bad parts and underperforming short-life tooling. The slide on the left shows carbides exposed to the tool surface, while the slide on the right shows carbides pulled out of tool steel due to an improper polishing technique. Photo courtesy Phygen Coatings. Temperature also varies among the various tool-coating processes. Chemical-vapor-deposition (CVD) coatings and thermal-diffusion (TD) coatings usually are applied at temperatures greater than 1800 F. Phygen’s coating requires significantly lower temperatures, claims Bell, lessening the chance of distortion that can play havoc with tolerances and minimizing tool-hardness concerns. Regardless of the coating used, experts insist that the tool substrate must be sufficient for the application. If contact during metalforming is particularly severe, even the toughest coating wears a. Most frequently, however, coatings fail by delamination, separating from the substrate. Extremely hard coatings are more susceptible to separation if they are brittle. If the forming load is high enough to deform the substrate more than the coating can withstand, the coating will crack. And when coating fragments release from the substrate, they act as an abrasive in the contact area, speeding wear. The coating cannot hide an inferior substrate. 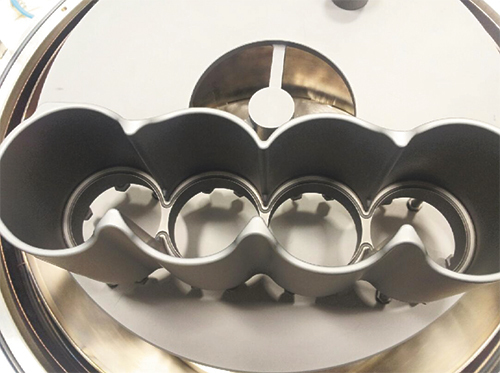 This part, following the DLC-Si coating process at Teikuro Corp., is ready for action. The process draws interest from automotive-parts makers as aluminum content increases in vehicles. “We take the ‘mountaintops’ (the rough surfaces of a tool substrate as seen through a microscope) down,” Bell explains. “This process does not create pockets to hold lubricant but provides a higher load-bearing surface for the coating to perform. The tooling is given a super-polished, super-slick film with a very low coefficient of fiction—less than 0.1 in typical lubricated conditions. That description hints at a major piece of advice from Bell: Tool coating requires a systematic approach. “A tool coating does not work by itself,” he says. “We strongly recommend, for example, that our customers use upgraded D2 materials. These tool steels have smaller carbides in their grain structure and exhibit increased toughness. When you polish standard D2, the carbides in the steel stick up and you end up polishing around those harder carbides. Hence, the roughness of the tool affects part quality and tool life. “A systems approach,” Bell continues, “includes better tool design, materials, surface preparation and coatings to give customers total value—long life and high performance. Placing a good coating on an inferior substrate is a waste of money. With part materials tending toward the exotic as new recipes come online for specific applications, so too are tooling materials evolving. Tool-steel substrates designed to tackle tough tasks in ever-tougher part materials do not come cheap, and consistent availability at any price is not guaranteed. 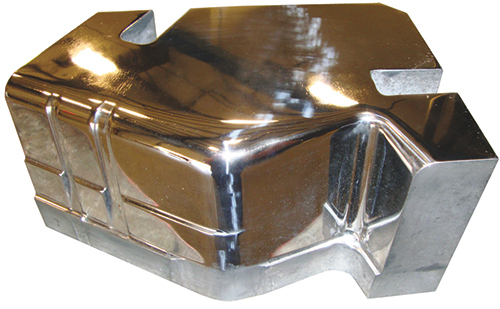 A tooling block has undergone the thermo-reactive diffusion (TRD) coating process at Teikuro Corp., one of several processes available from the company, which primarily serves the automotive industry. Consider vanadium and chromium, two key ingredients in tool steels. Only about 75,000 tons of vanadium is produced each year worldwide. Luckily, only tiny amounts of vanadium are required to double the strength of tool steels and provide corrosion and abrasion resistance. And while vanadium often is employed in steelmaking, a significant share finds use in tool-steel production. In heattreated alloy steels, vanadium provides temper resistance, resulting in high strength/hardness and toughness and excellent thermal properties. Steels of this type find use in a variety of forming and cutting tools and dies. Growth in vanadium demand is set to continue through 2013 and beyond, according to a report from Roskill Information Services titled, Vanadium: Global Industry Markets and Outlook (13th Edition). China and South Africa, the two largest vanadium suppliers, have historically been unstable in their supply of the metal, and its increased use in projects across developing countries should continue to stress supply. Chromium also is experiencing supply difficulties. Stainless steels contain a little more than 15 percent chromium, which is what hardens and toughens the steel and increases its corrosion resistance, especially at high temperatures. Chromium also is a key component in tooling material, and it can be difficult to source. The only domestic supply source of this critical element comes from the recycling of stainless-steel scrap, with its production largely confined to the Eastern Hemisphere. Because the United States has small chromium resources, there has been concern about domestic supply during every national military emergency since World War I, according to the U.S. Geological Survey. In recognition of the vulnerability of lengthy supply routes during military emergencies, chromium (in various forms, including chromite ore, chromium ferroalloys, and chromium metal) has been held in the National Defense Stockpile since before World War II. Since 1991, however, changes in national security considerations have resulted in reduced stockpile goals, and inventories are being sold. At the current rate, it is estimated that these stockpiles will be exhausted by 2015. In 2009, recycled chromium from stainless-steel scrap accounted for 61 percent of U.S. chromium apparent consumption, making recycled material the only domestic commercial supply source. Primarily serving automotive customers, Teikuro Corp., Springfield, OH, chrome-plates dies using proprietary processes and equipment, and offers other hard-coating processes to fit a range of stamping-tool needs. The chrome-plating of tools not only minimizes wear and galling, but also inhibits corrosion, eases cleaning and reduces friction. Teikuro often can turn around chrome-plating jobs within two days—a critical advantage in the fast-paced high-volume automotive arena. When we talked, the company was entering the busy summer-shutdown period, when OEMs and top tiers install new lines or extensively refurbish existing lines and dies. The company provides another process, thermo-reactive diffusion (TRD) coating, and employs a number of lines in Springfield for that process. A notable shift to aluminum substrate in the automotive industry brings increased use of another Teikuro-supplied process—Diamond-Like Carbon with Silicon (DLC-Si). For example, Ford is expected to roll out its next-generation F-150 pickups in 2015, reportedly featuring aluminum for the entire cab—including body-in-white and closure panels—and the bed. And, this year, GM introduces full-sized pickups with aluminum hoods and suspension components in some models. To meet higher demand, Alcoa announced in April that it expects to triple sales of aluminum sheet to automakers by 2015. And the trend won’t let up there—by 2025, aluminum is predicted to double its 2008 share in the automotive-materials mix, finds a recent study commissioned by the Aluminum in Transportation Group of the US Aluminum Association. This market shift means that metalformers used to prepping tooling for steel will have to get used to stamping aluminum—a gummy material that can splinter when formed and contaminate the tooling. As a result of increased aluminum forming, metalformers must ramp up preventive maintenance to ensure that the tooling stays clean, as particles can quickly wear tools and damage coatings. Metalformers, die designers, builders and maintainers can opt for coatings that work exceptionally well on aluminum, such as DLC-Si, according to Hamell. DLC-Si provides hardness, wear resistance and slickness, with reportedly the lowest coefficient of friction among tool coatings, including conventional DLC. That is one idea that Hamell tries to get across to anyone looking to coat tools to maximize life and performance. The best coatings are only as good as their substrate materials and their application. Even then, substrate preparation is key. Remember, as Hamell says, coatings lock in workmanship. Hamell offers one final word of caution: Coated tools work more quickly and smoothly than uncoated tools. 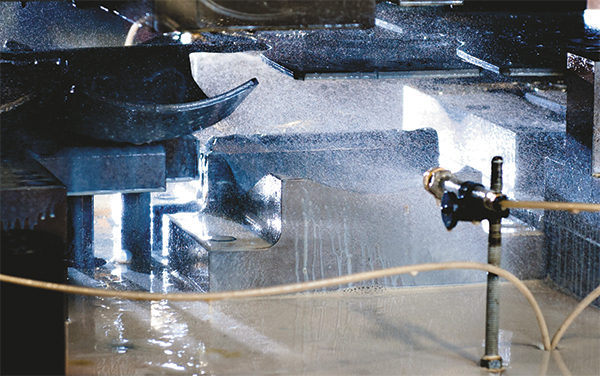 The addition of coating requires a look at equipment settings for optimal forming performance. See also: Phygen Coatings, Inc., Teikuro Corp.